Juba, South Sudan – In one of the most dangerous places in the world, the Rev. Peter Tibi stands between the government of South Sudan and rebel factions with only his clerical collar and his faith for protection. The director of RECONCILE International (Resource Center for Civil Leadership) uses shuttle diplomacy to carry information between the two groups with the goal of discouraging armed conflict, negotiating humanitarian access and preventing revenge killings. There is so much distrust, the two groups will not even agree to direct discussions. Since South Sudan’s birth as a nation in 2011, over 50,000 people have been killed, more than 1.9 million have been internally displaced and 1.8 million have fled the country. Under the threat of international sanctions President Salva Kiir signed a peace agreement with rebel leader and former Vice President Riek Machar in August 2015. Machar returned to Juba in April 2016 and was sworn in as vice president. Just three months later, violence broke out again between the two factions. Both sides blame the other for violating the ceasefire. Although it may seem difficult to remain hopeful, Tibi says many people long for peace. 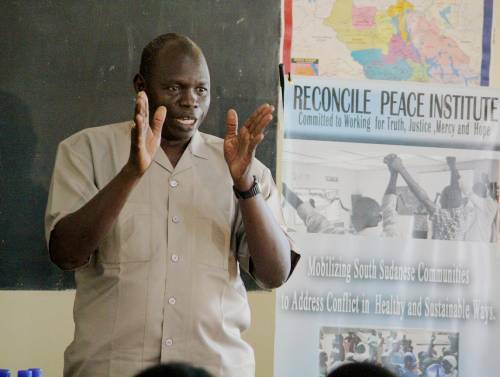 In April and May, RECONCILE held trainings for representatives from government, police and prison to foster understanding of the peace process and to work toward peaceful co-existence skills in mediation. They hoped for 40 people, but more than 115 attended. Unfortunately, the conflict rages on. Near the city of Yei — the home of RECONCILE — more than 1,700 houses have been burned. People have fled. Shops, markets and medical facilities have closed. The staff of RECONCILE has evacuated to IDP (internally displaced persons) camps in South Sudan and to refugee camps in Uganda where they continue to teach peacebuilding skills. The Revs. Shelvis and Nancy Smith-Mather, who are mission co-workers, have not yet been able to return to South Sudan so they have moved to Arua, Uganda, to help RECONCILE carry out its work in the refugee camps, Rhino Camp Refugee Settlement and Bidi Bidi Refugee Settlement in northwestern Uganda. With over 270,000 people, the Bidi Bidi camp is currently the largest refugee settlement in the world. The Smith-Mathers now see their closest neighbors from South Sudan not at home, but in a refugee camp. Nancy Smith-Mather attended Palm Sunday services there. Mission co-worker Leisa Wagstaff was evacuated from South Sudan in July, but has returned to continue training teachers, sometimes in refugee camps. South Sudan has the highest number of children not in school anywhere else in the world. UNICEF says that more girls die in childbirth than graduate from high school. She continues her work with passion, even though she often hears heartbreaking stories, like the one from a Presbyterian woman who lives in one of the camps. The Rev. Debbie Braaksma, coordinator of the Africa-area office, knows the people and the challenges well. She and her husband served as mission co-workers in South Sudan for five years and her work now takes her back to South Sudan regularly. But the people of South Sudan now have even more to worry about than violence. An epic, man-made famine is already gripping the country. Opposing forces more often hit civilians rather than one another. In South Sudan, they have raided cattle and burned homes and fields. Because so many have been forced to flee, people cannot plant crops or must abandon them. Famine is declared when people are literally starving to death. Estimates are that about 100,000 face immediate starvation and more than 1 million are in danger. Since inter-ethnic divisions are one of the root causes of the conflict, including not only the two largest ethnic groups, Dinka and Nuer, but also representatives from many of the 62 other tribes, is considered essential. Tibi is grateful his clerical collar gives him access to places where others cannot go. His collar does not deflect bullets, but he rarely thinks about that. His mind is focused on peace. Note: Just this week, Tibi reported by phone to Presbyterian World Mission that Yei is now at the epicenter of the fighting.